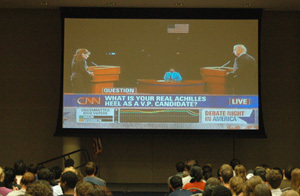 Format: Ninety-second answers for each candidate, followed by two-minute discussion. Two-minute closing statements. Overview: Much attention in the lead up to this debate focused on Gov. Palin. Commentators had blistered her for weak performances in recent interviews with CBS News anchor Katie Couric, and even some conservatives raised questions about Palin's qualifications for the office and called on her to withdraw from the ticket. In short, expectations were low. Meanwhile, major concerns for Sen. Biden were that he might appear patronizing or condescending or be long-winded. Neither candidate made any major blunders. Audience: 69.9 million viewers (47.8 million households). Source: Nielsen, based on live coverage on ABC, CBS, FOX, NBC, Telefutura, Telemundo, BBC-America, CNBC, CNN, FOX News Channel, and MSNBC. New York Times: "Candid but Pointed, Palin and Biden Face Off: Clashing on Iraq, Energy and the Economy" by Patrick Healy. and..."Surviving One Test" (Analysis) by Adam Nagourney. Medium shot of Palin and Biden and some of Palin's family after the debate. James Estrin/The New York Times. Washington Post: "Courting Middle-Class Voters: Palin and Biden State Cases for Changing Washington, Repairing Economy" by Robert Barnes and Juliet Eilperin. and..."Palin Delivers, but Doubt Not Erased" (Analysis) by Dan Balz. Medium shot of Biden and Palin talking after the debate, Palin's daughter Piper in the middle. Wall Street Journal: "Biden, Palin Clash on Taxes, Iraq in Sharp-Edged Debate" by Laura Meckler and Christopher Cooper. Two photos - medium close ups of Biden and of Palin gesturing during the debate. USA Today: "Biden, Palin make their cases in spirited debate: Sharp differences on economy, Iraq as both hold their own" by Martha T. Moore and David Jackson. Medium close up of Biden and Palin before the debate. Washington Times: "Biden, Palin battle over Iraq plans: Defend running mates' positions" by Joseph Curl and Christina Bellantoni. and... "Alaskan delivers folksy message" (Analysis) by Stephen Dinan. Medium shot of Biden and Palin greeting each other before the debate. Sponsors : Emerson, AT&T and Wachovia Securities.